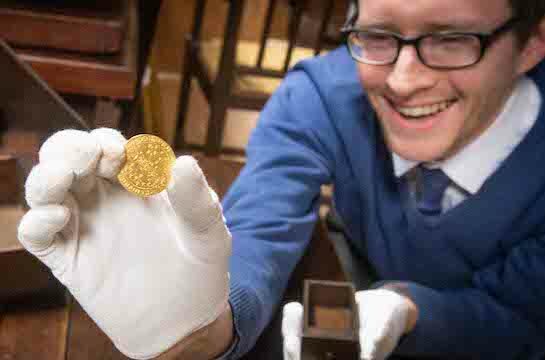 A 14th-century French gold coin found by chance inside a tiny secret drawer of a 20th-century bureau – much to the delight of its stunned owner – has sold for hundreds of pounds at auction. Derbyshire mum Amy Clapp, 37, had no idea the coin, or the secret drawer, existed after being left the furniture by a long-lost distant cousin. The coin, a Raymond IV Prince of Orange, 22ct gold Franc A Pied coin from 1365, was discovered by furniture valuer Edward Rycroft at Hansons auction house in Derbyshire when the item was consigned for sale. Edward said, “I know these secret drawers exist, so routinely check them. But in 10 years of furniture valuing I’ve never found anything, so I was stunned when I pulled out the coin. I knew straight away it was special and worth far more than the bureau. The piece of furniture sold for £260 – treble its low estimate of £80-£100 – in Hansons’ February furniture auction. Meanwhile, the coin fetched a hammer price of £850 in Hansons’ Coin Auction in March. The total price paid for the coin, with buyer’s premium and VAT, was £1,054. It sold to a private Midlands collector. Amy and husband Gary, 53, who have six children between them, went along to Hansons to watch the auction unfold. “It’s been an amazing experience,” said Mrs Clapp. “I’ve never been to an auction before. It’s also been a surprise to see the story in the news.